Above: Native designs now grace repurposed satellite dishes in Grants. Photograph by Jazmen Bradford. Recall the satellite dishes of yore? Those big, bulky pieces of equipment that once received signals on lawns all across the world and are now mostly obsolete—or at least downsized into rooftop models. John Badal, former president of onetime technology giant Qwest, had a number of those very dishes on his hands. Instead of tossing them out, he wondered how they might be repurposed. 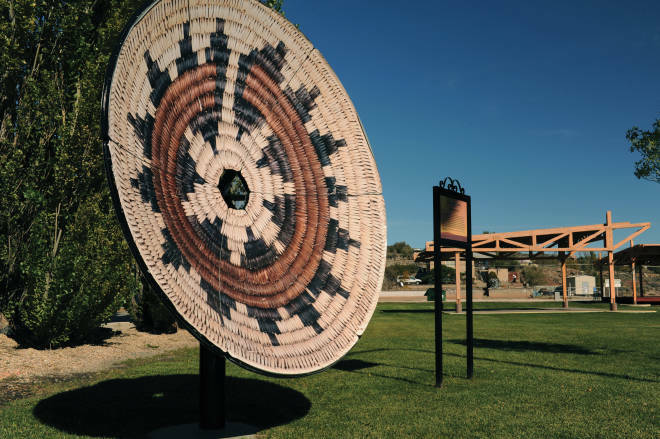 Now the founder of Sacred Wind Communications, an employee-owned high-speed internet and telephone company that services the Navajo Nation, as well as the Grants area, Badal hatched an idea for an art installation: Enlarge copies of Native basket designs, print them on vinyl, and turn six of the dishes into stand-alone artworks. Installed on the north side of Old Route 66 in Grants, between the New Mexico Mining Museum and Fire and Ice Park, The Native Basket Array is what Robert Gallegos, of the Cibola Arts Council, describes as “a windshield museum”—art that motorists and pedestrians can appreciate while cruising the historic route. Three of the dishes feature historical Native basket designs, including two from the collection of the Maxwell Museum of Anthropology, in Albuquerque: a Navajo wedding basket that symbolizes a person’s lifeway, and an Apache star. The third, a Chacoan basket, was patterned after one found in the 1980s by Boy Scouts who were hiking on the nearby lava flows. The original is in the Mining Museum. Contemporary artists Sam Chavez, of Acoma and Santo Domingo Pueblos, Gilbert Waconda, of Laguna Pueblo, and Lezle Williams, of Albuquerque, were commissioned to create the remaining three designs. Pull off I-40 to glimpse the installation on Route 66. Badal and others hope to expand it farther along the road and onto the south side of the street.